attocube’s probe stations are known for their modularity and flexibility, and can be customized to the needs of the user. 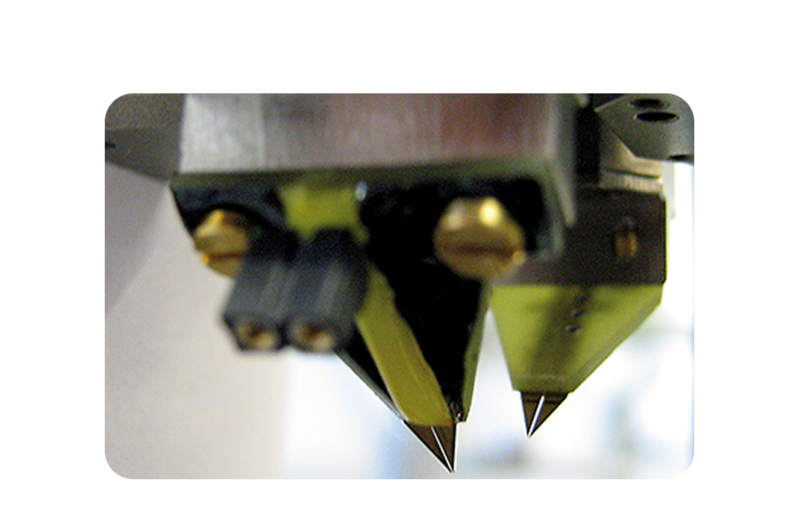 At the heart of every probe station, attocube’s nanopositioners perform the task of positioning and aligning the probe tips with highest accuracy and reproducibility. In combination with the outstanding design of our probe stations, this allows for a variety of ultra-stable electrical and mechanical measurements over a wide temperature and magnetic field range. Up to four three-axis probe heads can be operated simultaneously while a CCD camera on top of the instrument records the precise position of each probe tip. In the attoCPS I probe station, four DC, HF or optical fiber probes can be positioned accurately on the sample surface or contact pads. Each equipped with a travel range of several millimeters in (x,y,z). The sample is mounted onto a sample holder which enables convenient additional contacting with high frequency coaxial cables if desired. This innovative system enables multiple device testing within one cooling cycle, supporting our customers to produce scientific results reliably and time efficiently. In contrast to the attoCPS I with its fixed sample configuration, the attoCPS II offers the possibility to move both the sample and up to four probe tips simultaneously and independently in xyz direction. This setup is particularly useful for multiple device testing with identical contact pad spacing. The probe tips have to be adjusted to match the contact pad pattern only once. For measurements on a subsequent sample, the sample holder is simply moved from one device to the next, while keeping the probe tips at their intermutual spacing. This allows time efficient testing of multiple devices within one cooling cycle. 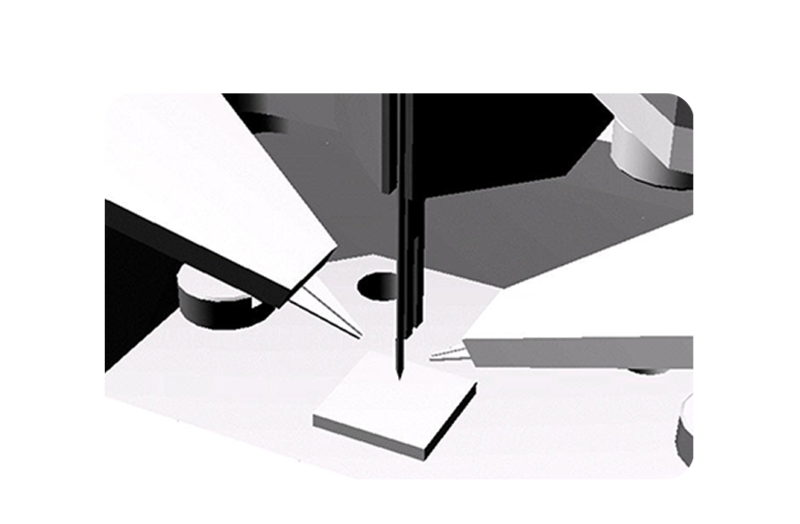 Illustration of a customized probe station applying two HF probes and one Scanning Optical Near-Field (SNOM) tip. 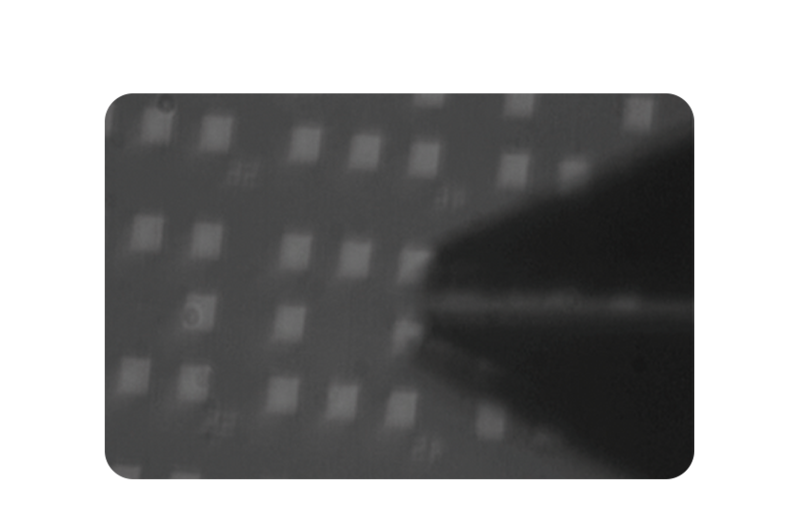 CCD image showing the contact pads (footprint: 50x 50 µm2) of the sample and one HF probe. Close up photo of two DC probes.